Resilient Ecuador LGBT rights activists and the first trans woman to stand for public office, Diane Marie Rodrigues, who currently lives in hiding in her country, is tipped to scoop the2015 Front Line Defenders Award for Human Rights Defenders at Risk. 27 countries nominated candidates for this award, however the jury has announced this year’s 5 finalists, all of whom are either in jail, in hiding or face the threat of jail because of their peaceful work defending the rights of others. 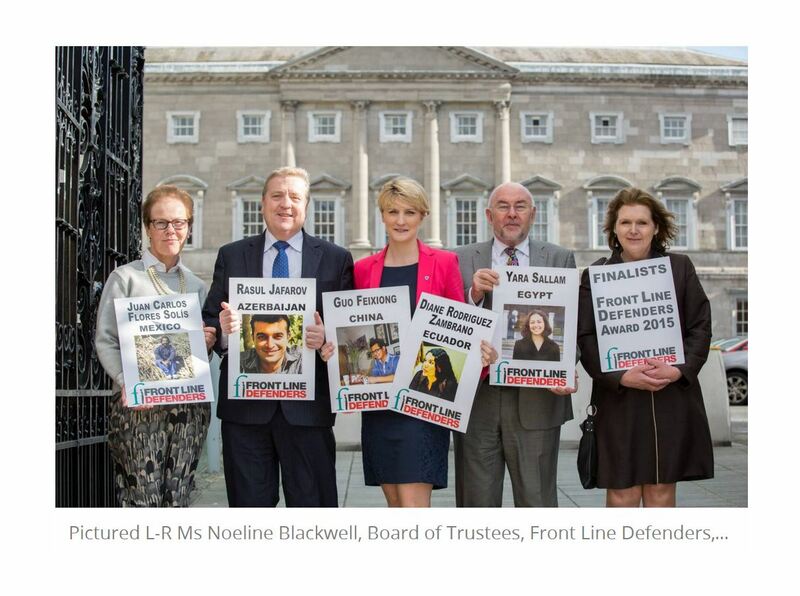 The winner of the 2015 Front Line Defenders Award will be announced at an event in Dublin’s City Hall on 1 May. The Jury consists of Mr Pat Breen TD, Chair of the Oireachtas Committee on Foreign Affairs and Trade, Senator Averil Power, Mr Simon Coveney TD, Minister for Agriculture and the Marine, Mr Ruairi Quinn TD, Mr Sami Alhaj, representing Al Jazeera and Ms Noeline Blackwell, Board of Trustees, Front Line . During a meeting which took place in Buswell’s Hotel in Dublin, the jury decided that the Finalists for the 2015 Front Line Defenders Award are: Juan Carlos Flores Solís Mexico, an environmental rights campaigner, was recently released from prison, but has a charge pending, because he led the opposition of local peasant and indigenous communities to the construction of a gas pipeline on their land near an active volcano. Diane Marie Rodríguez Zambrano Ecuador, LGBTI rights activist and the first trans woman to stand for public office in Ecuador is currently living in a safe house following death threats because of her work promoting the rights of the transgender community. Rasul Jafarov one of the most prominent HRDs in Azerbaijan was arrested on bogus charges of “ illegal enterprise, tax evasion, and abuse of official power. A lawyer by profession, Rasul Jafarov is Head of the Human Rights Club and Coordinator of the Art for Democracy campaign, which has launched several campaigns against politically motivated imprisonment, including the Sing for Democracy campaign, which took place in the run-up to the Eurovision Song Contest in May 2012. His is still in detention and his trial is on going. Yara Sallam – Egypt is a human rights lawyer with the Egyptian Initiative for Personal Rights (EIPR). On 21 June 2014, she was arrested with other protesters during a peaceful demonstration against the controversial “Protest Law”. On 29 October 2014, Yara, and a number of other activists, were convicted on these charges, despite the absence of credible evidence and clear inconsistencies in police reports of the event. She was sentenced to three years’ imprisonment, three years’ police monitoring and a fine of 10,000 Egyptian Pounds (approx. €1,098). This sentence was later reduced on appeal to two years’ imprisonment, two years’ monitoring and no fine. – Around the world human rights defenders are smeared in the media, arrested and intimidated and accused of undermining the interests of the state or involvement in terrorism. The Front Line Defenders Award recognises the legitimacy of their work and highlights their role in creating more just and equal societies. – As we celebrate the courage and commitment of 5 exceptional human rights defenders it is a matter of deep concern that all of the Finalists for this year’s Front Line Defenders Award are either in jail, in hiding or face the threat of jail simply because they have the courage to defend the rights of others. fine. It is hoped that the publicity surrounding the Front Line Defenders Award will help the 5 finalists to build international support for their work. The Frontline Defenders award is presented annually to a human rights defender who has made an exceptional contribution to defending the human rights of others in her/his country.